There's an upside to having a neglected landscape. A weedy garden or overgrown field is a boon to some wintertime visitors. The American goldfinch (Carduelis tristis) is a seasonal fixture in the Sunshine State. This half-ounce bundle of bones and feathers likes nothing more than discovering safe foraging grounds dotted with dandelions, ragweed, milkweed, evening primrose or — most especially — those prickly, pesky thistle plants. Like any true lover of warm weather, the state bird of Iowa, New Jersey and Washington leaves Northern abodes in early autumn when cold winds carrying a hint of snow start ruffling feathers. 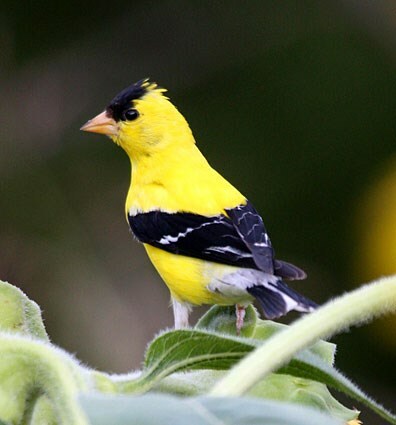 Traveling south in large colonies that often include other migratory birds, goldfinches settle in areas where a temperate climate extends the growing season. Lately when taking a walk, I've noticed flocks of "wild canaries," as they are nicknamed, flittering across our fields and open spaces. These 4-1/2-inch-long fliers with an 8-inch wingspan consider food finding a group effort. When not after the above-mentioned seeds, they munch on sunflower, cosmos, aster and grass seeds, occasionally snacking on tree sap, buds and berries with an incidental insect for protein. Because goldfinches come to Florida for respite rather than procreation, we miss seeing their finest displays of color. During a Northern spring, the male boasts a golden body with a bright white rump. His wings are black with white stripes and a jaunty black cap covers his head. This jazzy get-up is all about attracting the gals — actually, one girl in particular. Goldfinches are monogamous and mate for life. After mating, the female proceeds to build a tightly woven, cup-shaped nest in the forked branches of a tree and lays four to six light blue eggs. The reproduction period takes place mid-to-late summer when weed seeds are plentiful. The eggs incubate for 10 to 12 days before hatching and 12 to 17 days later, the young birds leave the nest to spend several weeks stuffing themselves with seeds. Shortly afterward, the hatchlings join up with other goldfinches migrating south to warmer weather. By the time the birds arrive in Florida in early autumn, the male's yellow plumage has faded to a dull olive. However, as the months go by and anticipation of returning north to mate mounts, the males' cheery coloration begins to return. When mid-February rolls around, a lemony sheen appears on the male bird's underside, growing more brilliant as the weeks go by. The female, with more need for protection than ostentatious presentation, doesn't go through a similar molt. She has no black cap and only a hint of yellow on her underside. Her slightly striped olive tones enable her to blend well with foliage year round. Goldfinches gravitate toward natural sources of food but when weed seed supplies dwindle, they frequent backyard feeders. 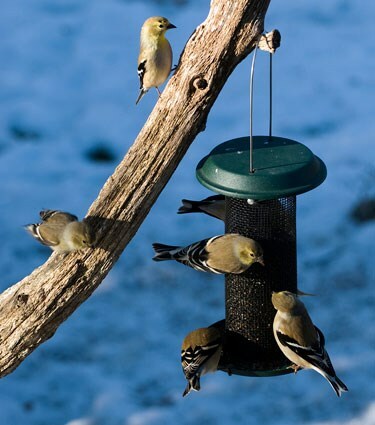 People wishing to attract goldfinches can do so during winter by putting out fresh nyjer (thistle) and sunflower seeds. Nyjer is a high-energy food rich in oil. While nyjer seed will draw these pretty little birds to the feeder, its high oil content goes rancid quickly. To ensure a fresh supply, clean feeders at least once a month and store surplus seed in an airtight container. Although I haven't filled feeders with nyjer or sunflower seeds, the goldfinches in our yard are not going hungry. Untended fields and weedy gardens provide plenty of natural foraging fare. To an uninformed eye, my garden might look ugly but the birds and I know there is beauty in sustenance. It's also reassuring to discover a beneficial side to laziness.